BUSINESS: The Cabinet on Tuesday approved a budget deficit of B350 billion for the 2012 fiscal year, starting October 1, according to Finance Minister Thirachai Phuvanatnaranubala. Finance Minister Thirachai Phuvanatnaranubala: budget up by 7.4pc. Of the total budget, annual government spending was approved at B2.33 trillion, an increase of 7.4 per cent from the fiscal 2011 budget at B2.1 trillion. The investment budget, counting for 16.5 per cent of the overall budget, was agreed at B380 billion, a 8.1-per cent increase year-on-year. The next fiscal year’s revenue is aimed at B1.98 trillion, a rise of 11.9 per cent from that of Fiscal Year 2011 at B1.77 trillion. The total budget approved was based on economic conditions in 2012 forecast to expand at 4.5-5.5 per cent and have inflation rates at 3-4 per cent. 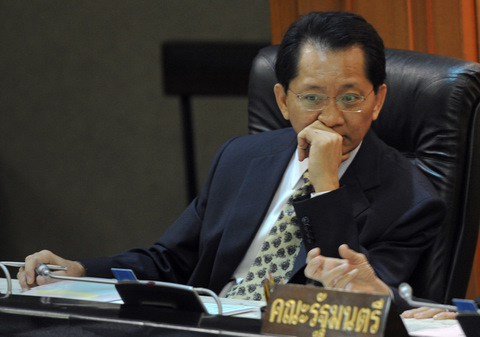 In this regard, Deputy Finance Minister Boonsong Teriyapirom said among other issues Cabinet approved on Tuesday were an extended period for a diesel tax cut and the Pheu Thai Party’s first-car project. The fuel tax cut, which is to last until December 31, will affect Excise Department revenues of B25 billion, but the government is trying to maintain the tax rate at B0.0050 from the current rate of B5.3, Mr Boonsong said. Meanwhile, Deputy Government Spokeswoman Anuttama Amornwiwat said Cabinet also approved the National Rice Policy Committee’s proposal on the 2011/2012 rice mortgage scheme for in-season unmilled rice, which is to start October 7 and continue until February 29. The criterion for mortgaged rice is that the level of humidity per ton of unmilled rice must be under 15 per cent. The mortgage price for hom mali fragrant rice (jasmine rice) is set at B20,000, Thai Pathumthani fragrant rice at B16,000, while other types of fragrant rice are at B18,000, and 100 per cent unhusked rice at B15,000.